We recently came across my add-a-pearl necklace that I had as a baby. I hadn’t even thought about giving it to Madeline. As soon as she opened the box, she put it on and said she gets compliments every day. It really does look so sweet on her. 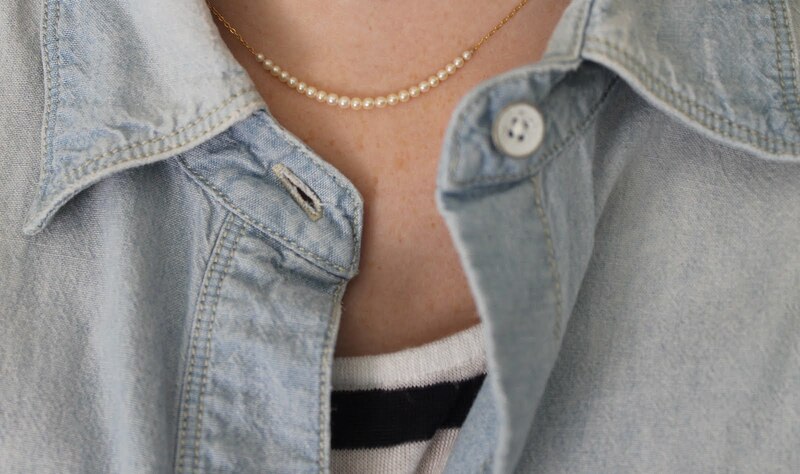 She’s wearing it with a denim shirt from Madewell. We both LOVE this store! We started shopping at the first one in SoHo and then Greenwich, CT. When we moved west we used to have to drive to LA, but now there’s one at South Coast Plaza. She paired it with a stripe tee from Brandy Melville. We came across this store in Santa Monica last summer and now there’s one in Fashion Island, Newport Beach. The price point seems to be around $28 for tops and surprisingly everything holds up well. Have you shopped at Madewell or Brandy Melville? I found out after a google search that add-a-pearl is a Chicago based company since 1854. 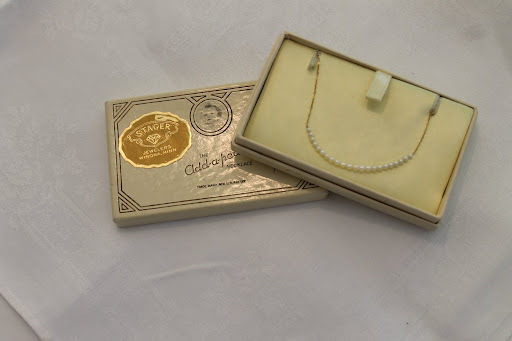 Wow that pearl necklace is so cute and clever you for keeping the original box! It looks great on Madeline.There are some designers who have created similar necklaces in semi precious stones…this surely must have been the original!My DIL has shopped Madewell online and been happy with her purchases.Hope that your weekend has been a fun one. That is so lovely. I love that idea…..very clever. So neat to have kept the original box.